Every second on marketplaces such as Amazon and eBay, merchants are adjusting their list prices in response to competition and other market conditions. Repricing is a core concept in e-commerce. And as with many aspects of e-commerce, the sellers who do it best tend to be the ones who make use of tech. Repricing software allows a seller to lower or raise their inventory prices instantly and automatically, in accordance with a predetermined pricing strategy. As a result, the seller outperforms competitors, captures more Buy Boxes, and maximizes margins on every sale. Dynamic pricing has always been a part of shopping, both online and in stores. Customers typically want the lowest prices possible, pitting merchants against each other in an eternal struggle to offer greater savings than their competitors. But pricing is complicated. Merchants need to account for supply and demand; the rarer a product, and the more people want it, the more valuable it is. Assuming you can afford to set dirt cheap prices, you run the risk of alienating shoppers. Consider the questions an iPhone listed for $50 might raise: Is it a bootleg? A scam? Profitability matters as well—sell too low, and you won’t be in business for very long. In short, a product’s value isn’t fixed, so its price shouldn't be, either. Does My Business Need Repricing Software? I know what you’re thinking: do I really need another software solution? Can’t I just log in to Amazon, eBay, or whichever marketplace and change my prices myself? Yes, you certainly can reprice your inventory manually. But for e-commerce businesses with hundreds of products for sale and plans to grow, manual repricing isn't scalable. At high volumes, manual repricing poses enormous risk in terms of human error and opportunity cost. What if you miss a digit and sell an item for $7.50 instead of $17.50? How can you be confident you’ve calculated correctly and are not setting prices so low that you’re undercutting your business? Moreover, manual repricing is a one-dimensional approach. It doesn’t account for other factors, such as fulfillment method, shipping time, and customer feedback, that determine who wins the Buy Box. On top of all that, repricing is about speed. Competition over the Buy Box is occurring at a faster and faster rate across e-commerce marketplaces, with prices on some items changing multiple times per day and sellers outperforming each other in seconds. If you don’t want to spend your days glued to your inventory dashboard, you’ll need smart repricing software. 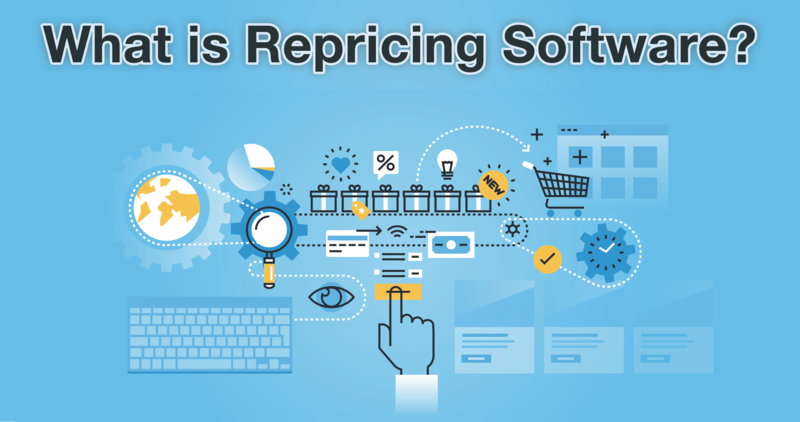 How Does Repricing Software Work? At SellerActive, our repricing software is built on the idea that every business has different goals. Whether you're looking to capture more Amazon Buy Boxes, move stock off your shelves quickly, or simply mirror prices across all sales channels, we have repricing strategies to suit your needs. Our repricing software provides sellers with the power to configure price strategies on their terms, and have listings automatically update in line those strategies. Essentially, it’s a “set it and forget it” repricing model you can count on to generate the most sales and the best margins possible. Our repricing methods also help sellers gain better visibility into their competition with precise Buy Box and sales analytics. Here are a few of the repricing strategies we can help you put in place. With Algorithmic Repricing, our self-learning algorithms will do the work of strategizing for you. This approach uses numerous dimensions of your sales and customer data to ensure your listings remain optimized at all times. You can configure risk tolerance and precision settings to ensure your prices stay within an acceptable range. Sellers who use the Algorithmic Repricing option capture the Buy Box an average of 72% of the time. If you prefer to have fuller control over your listings and prices, our Rule-Based Repricing strategies are for you. You can decide which factors—such as competitors’ prices, the time of day, and other changes in the marketplace—trigger price changes. Have a certain number of products you’re aiming to sell in a certain period of time? SellerActive’s Velocity-based Repricing strategy allows you to set prices to match your minimum and maximum sales thresholds, so you can move inventory without risking sellouts or missing out on profit when listings perform well. Our Price Mirroring Pricing strategy keeps prices synchronized between one marketplace and, with an optional dollar or percentage modifier. This is an ideal option for sellers on marketplaces that require price parity; Amazon, for example, prohibits merchants from selling the same items in their inventory at lower prices elsewhere. Finally, we offer Fallback Pricing options, which make it easy to quickly switch between repricing strategies if your chosen configuration isn’t delivering results. If you’re ready to learn more about repricing, why not try it out for yourself? Give SellerActive a spin with a free consultation and live demo.